So, I've gotten a lot of emails about this headboard and I want you all to know it so easy to do on your own! The cost of this was roughly under $20. Plywood...I forget the exact measurement but it was about 54"x40something, just enough to cover the end of your bed. Fabric - white is a tricky color - its usually see through or ultra expensive to get non-see through, but I found out a trick! Ready for it???? Drapery lining. It's only $5/yard...and if you have a coupon: $2.50! Can't beat that. You can get the rest of the How-To at this post. Ooh, I love it! I saw a similiar plush headboard in my Ballard Designs catalog & have been drooling over it ever since. Now, I know how to do it on my own (for wayyyy less)-thanks so much for sharing!! thats amazing! 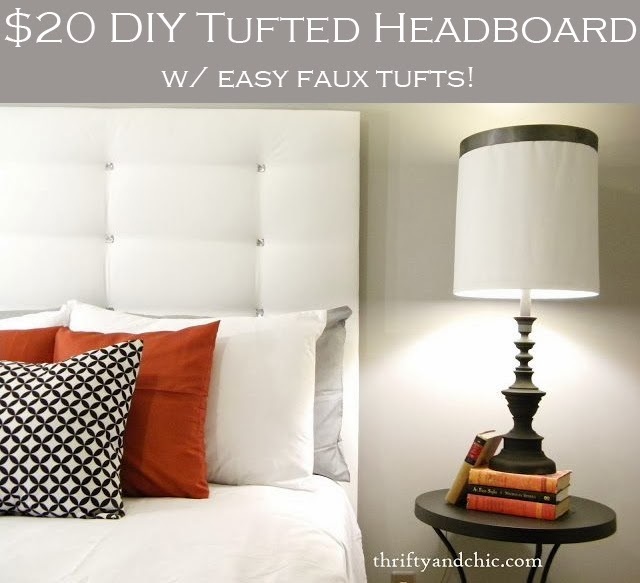 i always swoon over a tufted headboard, but i never knew how to make it happen in my home. i have enjoyed reading about your latest project, and would love your thoughts on mine, if you have a moment to stop by. I love, love your work! I would like to make a double barrel lampshade as a chandelier...do you have any suggestions on how to go about it? Okay I have GOT to know what color your walls are! I've been trying to find a gray that is JUST gray - no blues, no yellows, no purples - just gray! Whoa this is lovely!! Nice work! Did you do the lamps yourself too? I want to redo some lamp shades but have no idea! Please advise:) LOVE this headbord and will be going tomorrow to find fabric to create myself. Been looking for this type of DIY headboard for a while. thanks for sharing!! I am in the middle of moving into a new apartment, and the first one by myself. Looking at buying things on a budget has been quite a hassle. I found your headboard tutorial on Pinterest and decided to try it out for myself. Nailed it! I used a cheap-ey sheet instead of fabric andd worked like a gem. I plan to use some of your other tutorials for ideas around the house. I can't tell you how happy I am to have stumbled upon your blog. OMG you have inspired me so much!!! I need an entire new bedroom and I was so afraid because I know how much money it costs but now I am so inspired to DIY like EVERYTHING!! Amazing job and I love the bling buttons instead of the normal ones....very nice touch. Hello! Do you take orders? This looks INCREDIBLE! Unfortunately, this looks a little advanced for my seriously lacking DIY skills, but I WISH I could pull this off. I just discovered your blog via Pinterest, and I'm about to check out your other posts! Love it. This looks fantastic, I have been looking for a headboard to cover a window in my house that leads to nowhere. I have small children, and I'd be heart broken if peanut butter or paint got smeared on the fabric. If I don't want white (ie drapery lining) what would be the next best kind of fabric you would use? Beautiful! I love the idea of the drapery liner for the fabric.....genius! My husband and I made one of these the day I found your blog!!! I couldn't wait! I love walking into my room now! The only thing I disagreed with was the price. We bought a twin sheet that cost 4.47 at WalMart so super cheap and we got a discount off the wood and supplies at Lowes. The one thing we changed was the batting to foam but it was cheaper any way. In total our King size head board cost approx 60-70 Dollars. A fantastic deal for what we got compared to buying a new bed, but more than expected when I went into it thinking 20-30. I guess making a full/queen headboard might be a lot cheaper. I wouldn't think so, but I do know foam is a bunch more money. I got the batting on sale I believe at Joanns, so that might have made a difference in the price also. As for the plywood, it also depends on which you get. They have 8x10 sheets for around $8-$10. The fabric as mentioned above above was only $2.50 a yard. So that puts the price right around $20. Sorry if you were caught of guard when it ended up being so much more expensive! That's happen to me quite a few times. But I'm glad your headboard ended up turning out great!! This rocks! Awesome job. Would like to give it a try soon, since my boyfriend and I don't have one at the moment. And it's so cheap too! Would you mind sharing what color your wall is?! I am in love with it! I know you said you got the batting from Joann's, but any idea the brand? I can't find 2" batting anywhere, and 4 layers of 1" batting would be a bit pricey. I'm loving this headboard. Can I ask how it has held up over time? We're thinking of doing white fabric instead of gray for ours, but my husband is concerned about the white fabric yellowing. Thanks for any input! Mine is ending up costing me about 100+ to be fair I made a head and foot board. given the extras like using 2 in foam and decorative bits, I would say in real life this would be a 40$ project.